It's been a long time since percussionist/composer Alex Cline last released an album under his own name. 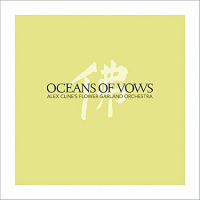 1999's Sparks Fly Upward and 2001's The Constant Flame (both on Cryptogramophone), culminated his evolving Alex Cline Ensemble, combining measured spontaneity with long-form writing that, in its near-classical approach to compositional development, was a unique confluence of form and freedom. 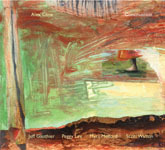 Continuation represents two significant changes for Cline: first, it's a far more overtly improvisational disc than his Ensemble records, even as Cline's predilection as a composer continues to evolve; second, with the exception of returning violinist Jeff Gauthier, it's an brand new line-up, featuring Canadian cellist Peggy Lee, bassist Scott Walton and pianist Myra Melford, whose The Image of Your Body (Cryptogramophone, 2006), in many ways reflects a deep spiritual nature also found in Cline's work. The string-led nature of Continuation often works in tension-based odds with the percussion-driven work of Cline and Melford. The 18-minute "Submerge" begins with Cline's vast array of tuned and untuned percussion instruments, with Melford's gentle harmonium and the three strings entering almost tentatively, as space is used to best advantage to create a reflective ambience. The dynamic gradually builds, with harmonium and strings creating a densely layered melodicism that's juxtaposed with passages of Cline's spare percussion, leading to a finale of soothing tranquility that, like much of Cline's work, feels more oriental than occidental. "Nourishing Our Roots" is a gentle opener, an ethereal tone poem that features Walton's visceral tone and Melford as distanced from her early, post-Cecil Taylorisms as possible before Gauthiera sadly overlooked violinistand rising star Lee come together in unison over the rubato foundation of their band-mates. "Clearing Out Our Streams," in contrast, swings in surprisingly Elvin Jones fashion after Walton's opening solo, turning into an Eastern-tinged modal workout for Melford's harmonium. 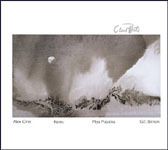 The abstract "Fade to Green" also uses space as a silent partner, Melford's repetitive, Morton Feldman-like piano pattern deceptively simple, creating a base for more abstruse improvisation from her band matesmost notably Cline, whose approach is more orchestral, avoiding the "look at me" trappings of typical drum solos. That said, while hardly conventional, the following "Steadfast" begins with a more traditional kit solo before settling into a compelling, bass riff-driven 7/4 groove that's interspersed with turbulent passages. Gauthier's delivers his finest playing of the set, with an equally superb Melford solo running the gamut from lean lyricism to hard-fisted block chords that return to her free jazz roots before leading into an aggressive, sharp-angled cello solo. Cline's interest in Oriental spirituality remains intact on this recording but the disc is stilldespite its often calming, meditative vibethe hardest-hitting album of his career. If Continuation is any indication, this is a new group that Cline needs to hang onto. Quite possibly the group he's been searching for all his life to best interpret his multifaceted, multi-stylistic and multicultural interests, Continuation is a most welcome return to recording for this daring and unconventional percussionist.